(TB2Q9ZC) Look Twice Geocoin - Todie's Wild Ride- Share the Road..Safely! Todie's Wild Ride- Share the Road..Safely! Use TB2Q9ZC to reference this item. How Can I Increase the Driver's Awareness of My Presence? Make yourself visible: Choose protective gear that will increase your visibility in addition to providing protection in the event of a crash. A motorcycle helmet is your most valuable piece of protective gear and should be most visible to the driver. Ride where you can be seen: Remember that there is no one safe place to ride. Use lane positioning to your advantage to be seen and to provide extra space for emergency braking situations or avoidance maneuvers. Avoid the driver's blind spots. Make your lane moves gradually, and always use appropriate signaling. Never share a lane with a car: A driver may not expect you to be there and may not be aware of your presence. Remember most drivers are looking for other, bigger vehicles. Clearly signal your intentions to the driver: Signal before changing lanes and never weave between lanes. n loving memory of Todie Phillips! Tod, 1/3 of Team Rod & Tod w/KAboom was tragically killed in a motorcycle accident when a motorist pulled into his lane unexpectedly. This accident was needless, the driver merely needed look and would have seen Tod there. This usually happens because of people being in a hurry. PLEASE take your time and help them arrive safely! 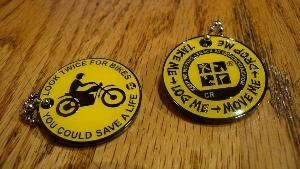 PLEASE keep this coin moving to help spread the word of bike awareness!! Gallery Images related to Todie's Wild Ride- Share the Road..Safely! This is a message to let you know that your trackable item TB2Q9ZC has been marked ‘missing’ by a cache owner or a site administrator. Trackable items are marked missing when it is determined that they are no longer located in the cache they are listed in or in the hands of the current holder. Please review the most recent logs on your trackable item to learn more information about its current state. This Coin is MIA at Far from Home. Visited today and no sign of the coin.